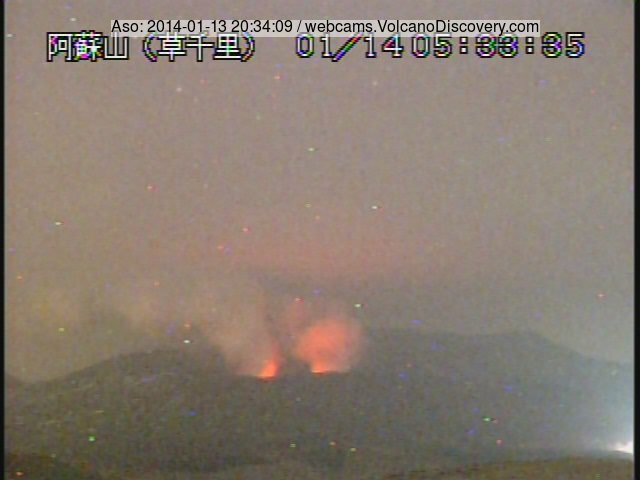 Aso (Kyushu): The volcano is active from 2 vents in the Nakadake crater. During the night, sometime strong incandescence, suggesting possible weak (strombolian-type) ejections of lava, steaming and minor ash venting are visible. Dukono (Halmahera): More explosions occurred today at the volcano. Ash plumes were reported at 10,000 ft (3 km) altitude extending up to 60 nautical miles to the NE. Pacaya (Guatemala): The volcano continues to effuse a weakly alimented lava flow from the southern fissure and has mild strombolian activity at the summit crater, with explosions occurring about every 2 minutes and ejections reaching 25-70 m above the crater. Fuego (Guatemala): Activity continues at moderate levels as during the past days. INSIVUMEH counted 13 moderate explosions with shock waves and ash plumes rising 300-800 m. The lava flow on the upper southern slope towards the Trinidad drainage was 300 m long this morning.